After starting 2016 with a massive rally, gold gave back some ground in the second half. At mid-year the metal was up more than 25%, but ultimately, it closed 8.5% higher in 2016. Of course, that was still good enough to break a three-year streak of price declines. And better still, gold stands a good chance of building even more upside momentum in 2017. We’re already off to a strong start, as gold touched a four-week high of $1,165 per ounce earlier this week. That compares to $1,060 per ounce at the start of 2016. Beyond that, gold is expected to post its highest average annual price in four years in 2017, according to a recent poll conducted by Reuters. The poll of 35 analysts and traders returned an average gold price forecast of $1,331 per ounce for 2017. That would be the highest average since 2013. That’s in line with what major banks foresee, as well. UBS, for example, sees gold prices climbing to $1,350 per ounce in 2017. Still more optimistic views have the metal touching $1,400, and even $1,500 per ounce. Part of the reason is simple supply and demand. The pipeline of new gold mines has been dwindling for a decade, and it’s only going to get worse from here on out. Indeed, there’s only so much gold in the earth, and most of it has already been extracted. 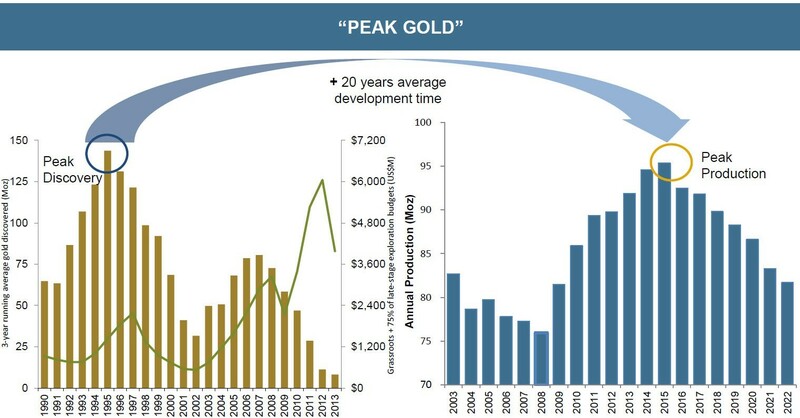 Just three primary gold deposits were discovered in 2014, down from a peak of 37 in 1987. Related: GOLD Is Steadily Rising And Entering Another Bull Market – Time To Catch This Train! As a result, gold mining output has peaked. From here on, it can only shrink. Mine supply will fall by roughly a third over the next decade. Demand, meanwhile, remains robust, especially among investors. Global investment demand rose at its fastest pace on record in the first half of 2016, climbing 141% in the second quarter, alone. That’s likely to accelerate as markets digest the uncertainty associated with the Brexit and a Trump presidency. But again, the key short-term factor driving gold will continue to be Fed policy. Gold prices accelerated at the start of 2016 because the Fed has adopted a leisurely pace to raising rates. After initiating a new monetary tightening cycle in December 2015, the Fed waited a full year before pulling its benchmark rate higher. And when the Fed did act, it raised rates by just 25 basis points, from a range of 0.25%-0.5% to 0.50%-0.75%. The sluggish pace of the rate increases has caused many investors to rethink gold’s investment potential. Indeed, it’s now clear that the three-year sell-off that whacked gold from its lofty perch above $1,700 was overdone. Now, the market is correcting to the upside. This is something that’s actually quite common. In periods of monetary tightening, everyone assumes the dollar will strengthen. But in reality, the dollar has a history of under-performing in time such as these. Look at the last two monetary tightening periods — in February 1994 and June 2004 — and you’ll see a nearly identical pattern. In both those cases, the dollar strengthened before the first rate hike, but then weakened by around 8% in the next six months. The dollar index then remained consistently below its level on the day of the first rate hike for the next two to three years. You’ll also note, in those instances, gold prices went higher. Gold more than doubled from 2004 to 2008, shooting from $400 per ounce to nearly $1,000 per ounce. What all this data and historical precedent says, basically, is that the market tends to over estimate the effect monetary tightening has on the dollar, and thus on gold. That leads to an unsubstantiated strengthening of the former and a unjustifiable weakening of the latter. That’s exactly what we saw in 2016, and in 2017 we’re likely to see it repeated. Indeed, gold was beaten down once more in anticipation of the Fed’s December rate hike. But the negative effect of that rate hike will fail to meet expectations, driving a reversal in both the dollar and gold. Hence, the higher forecast for gold prices among analysts and banks. They, too, have come to recognize the now familiar pattern. It’s crucial to remember that monetary policy is not the only determinant of the dollar or gold. Trade deficits and surpluses, government spending, growth, and inflation also matter. And perhaps most importantly of all, we must consider the role of other foreign currencies. Those all must now be measured through the prism of a Trump presidency. At this very moment, it’s difficult to foresee exactly what kind of policies a Trump presidency will bring. In it’s own way, that uncertainty is good for gold. But beyond that uncertainty, Donald Trump’s rhetoric has given a fair indication of how he intends to govern. For example, Trump has repeatedly lashed out at America’s trade partners, particularly China and Mexico. Well, dismantling NAFTA, labeling China a “currency manipulator,” and slapping tariffs on foreign products would not be conducive to U.S. economic growth or a strengthening dollar. To the contrary it would undermine the global economic order, curtail global growth, and likely prompt retaliatory measures from America’s biggest foreign creditor. That’d be negative for dollar, and bad the country as a whole, but great for gold. Furthermore, back on the domestic front, Donald Trump has proposed expansive government spending polices, and displayed a flippant attitude toward U.S. debt. The Trump tax plan, for instance, would reduce federal tax revenue by $6.2 trillion over the next 10 years, adding more than $5 trillion to the national debt. Trump has also pledged an expansive billion-dollar infrastructure program, and the construction of a border wall that would cost $25 billion. Again, this would be financed with debt that the new president doesn’t truly believe America has an obligation to pay. If Trump’s march to victory proves anything, it’s that traditionally conservative values (i.e. reduced levels of government spending, deficit reduction, and free trade) no longer apply. America’s 44th president will be free to pursue expansive fiscal policies that would otherwise be anathema to traditional, “establishment” Republicans. Should they come to fruition, Trump’s domestic spending plans will spur inflation. His tax plan would add some $5.3 trillion to the national debt. His foreign policy could well jeopardize the dollar’s role as the world’s primary reserve currency. And in the worst case scenario, Trump’s plan to cope with a $20 trillion debt burden by either printing enough money to pay it off, or convincing creditors to take less than what they’re owed would be downright destructive – not just for the dollar, but the global financial system. That alone makes gold a must-own for the next four years. There’s really nowhere to turn but hard assets like gold and silver. After regressing in the second half of 2016, gold should return to strength in 2017. The Federal Reserve raised rates in December, but it could be another year before the benchmark rate reaches a full 1%. The sluggish pace of the rate increases, and their modest impact, will lead investors to conclude, if they haven’t already, that gold’s sell-off was massively overdone. Meanwhile, the uncertainty surrounding a Trump presidency. What little we do know suggests President Trump’s foreign trade and domestic spending policies will have an adverse effect on the dollar – and thus a positive effect on gold. Abroad, Europe’s own economic restructuring and competitive currency devaluations in the Asia-Pacific region, will further exacerbate gold demand. Therefore, we can reasonably expect gold to top $1,300 per ounce in 2017, as most major investment banks predict. And that’s a fairly conservative estimate. In the most bullish scenario, gold could return to a heady $1,500 per ounce. GOLD Is Steadily Rising And Entering Another Bull Market – Time To Catch This Train! Why Are Cannabis Stocks Going So Crazy, And How Can You Cash In On Them Right Now?